Your little pup will love to train on bring you your slippers with the Slipper Dog Toy in Brown! I was disappointed when received in mail because the picture is misleading to the naked eye. 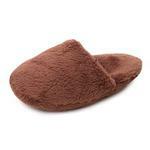 The slipper is no more than two inches long and maybe one inch wide. Though my toy poodle loves it, I am worried she could swallow it. With so many colors to choose from and being exceptionally priced I bought one of each color ! ?? Posted On 01/20/17 by LAUREL G from HAMMONTON, NJ Yes, LAUREL G recommends this product! After dealing with my dog's "puppy years" and trying to find the location of slippers, I thought that it was time that she had her own slipper! I use this site whenever I need anything for my little dog. they have very cute things and a good selection of sizes. I love the videos of the products because they explain how it goes on etc.